The Popocatepetl volcano has been periodically erupting since 1994 but experts do not believe this latest burst is related to Mexico City's recent earthquakes. 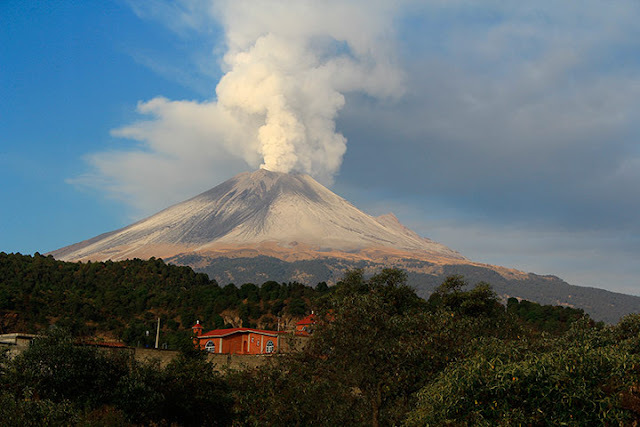 The volcano is at level 2 alert, meaning it could continue erupting ash and gas. The emissions come shortly after three powerful earthquakes that have killed more than 400 people. A 6.1 magnitude earthquake struck southeast of the town Matias Romero in Oaxaca, Mexico yesterday. According to the National Seismological Centre in Mexico there were three tremors, measuring on the Richter Scale 6.1 at 7.52am, 5.2 at 8.24am and 5 at 8:25am. Sergio Cedillo, 49, said: "I heard the alarm and ran downstairs with my family." No new damage was reported, but rescue efforts have been suspended in the areas affected to allow authorities to see if the new tremors would put workers at risk. The director of Mexico's disaster agency has said it is an aftershock of the 8.1 quake that hit last week off of the country's southern coast. The new quake swayed buildings in Mexico City, which is recovering from a magnitude 7.1 tremor that struck on Thursday.